Sofiane Feghouli’s West Ham future remains very much in the balance as Slaven Bilic considers his forward options over the summer. Bilic is still not entirely convinced that – despite a fine game against Burnley – the Algerian has the speed or level of consistency he requires. There is the added issue of knowing that the winger midfielder is probably the only player on the squad who would command a decent fee – thought to be in the region of £7-£8 million. Roma continues to be interested but Bilic will hold talks with the player ahead of making a decision after a season in which so many disappointed. A ClaretandHugh poll on the issue showed that a majority of fans (over 70 per cent ) believed the club should hold on to the 27 year old. 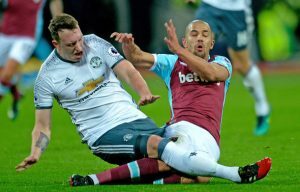 Feghouli revealed there was interest in him during the winter transfer market but the club was keen to keep him on board at that time but he revealed he was ready for talks with the manager. Keep him, he has more skill than Snodgrass, he is a game changer, if he has a decent forward to make the runs for him. if he’s a right winger, sell. does not convince out there – doesn’t defend, track back or take on his man. drifts & cuts inside constantly. if he’s a number 10, possibly keep as he loses his defensive responsibilities and seems to have a bit of skill about him. He is the only winger we have that consistently presses the ball, agree with the others on balance better to lose Snodgrass than Feghouli. Let them both go. Neither of them are good enough. I never wanted Snodgrass in our squad in the first place…….he was never better than an average Championship player when he was at Leeds and hasn’t improved since. Feghouli isn’t much better. “… the only player on the squad who would command a decent fee…”? Really? Anyway, that aside, sell him. He’s had his chance.